The present form of the building is a result of successive designs, constructions, remodeling and demolitions. The first building of Cabildo was built in the early years of Buenos in 1610, but due to the poor construction and lack of maintenance founds by the end of 17th century it was almost in ruins. The 18th century saw a continuous construction process of the new Cabildo (designed by an architect Andrea Bianchi Giovanni Turin), frequently postponed and restarted due to usual financial problems, changes to the plans and an effect of the new urban layout of the area. Especially the latter was devastating for Cabildo. In 1889 the main tower and the whole right wing of the building were demolished to make space for the newly enlarged Avenida de Mayo. In 1931 the left wing found the similar destiny to make room for the Diagonal Sur (Avenida de Julio Roca). The building took the present shape in 1940 when the architect Mario Buschiazzo guided by available original documents brought back Cabildo closely to its colonial form and splendor. It is the oldest building in the area of Barrio Monserrat and the only colonial structure on the Plaza de Mayo clearly contrasting with its 20th century surroundings. Today Cabildo, declared a National Historical Monument is home to the Historical Museum of the Cabildo of Buenos Aires and the Revolution of May. Thursdays and Fridays an artisan fair is held in the courtyard adding life and colors to this historical place. Right photo: behind the Cabildo there is the Government Palace of Buenos Aires, then former building of the Argentinean Bank of Uruguay and the Metropolitan Cathedral. The building was designed by the architect Eduardo Le Monnier as a headquarters of the Bank of Uruguay in Argentina. It is located at the corner of Diagonal Norte and Calle San Martin with the Municipal Palace to the left and the Metropolitan Cathedral on the right. The tower crowned with dome, cylindrical chamfer at the intersection of the streets and lavishly decorated facades with pilasters and balconies make it one of the tourists’ attractions. Bank’s misfortunes and “financial past” of the building are long gone. Its new era started when the building was acquired by the state. Today it houses offices for the Cabinet of Ministers. Banco de la Nación Argentina (National Bank of Argentina) This monumental structure was built for headquarters of the National Bank of Argentina (founded in 1891 by the President Carlos Pellegrini). Designed by an Argentinean architect Alejandro Bustillo in a neoclassical style the building was officially opened in 1952 – fourteen years after placing the cornerstone. It is located on the Rivadavia street (left to the Casa Rosada) on the place earlier occupied by the Teatro Colon. From the outside the most impressive is the entrance with its four gigantic columns encompassing equally massive steel sliding doors. Crossing the door you will find the central hall crowned with one of the world largest domes – orthogonal in shape supported by eight columns (interestingly, not visible from the outside). 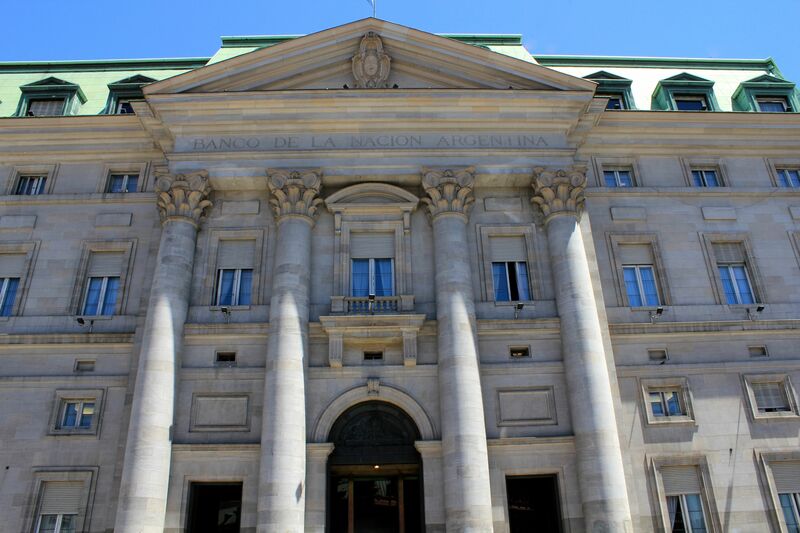 Today, while the main part of the building is still occupied by the National Bank of Argentina, the complex also houses the Alejandro Bustillo Art Gallery (opened in 1971) and a Numismatic Museum. The complex of the City Legislature is confined by the streets: Hipólito Yrigoyen, Peru and the diagonal Julio A. Rock. This five floors structure in the French Neoclassical style was built in short four years by an Argentinean architect Héctor Ayerza and constructor Luis Falcone. Inaugurated in 1931 it strikes with its 96 meters (320 ft) high central tower easily visible from far even in the high density cityscape of Montserrat. From close, the building charms with its richly decorated facades. The remarkable decoration of the last floor including 26 caryatides (each symbolizing different part of the urban life) is mostly work of an Italian sculptor Troiano Troiani). The landmark tower houses four well visible quadrants of 4m (12ft) diameter each and five bells with “melodic” names: Santa Maria, La Pinta, La Niña, La Porteña and Argentina. But that is not the end of what the tower hides from the eyes of passersby. It also holds a German-made 30 bells carillon. Connected to the wooden keypad with 30 musical notes it can be played manually or in a pre-programmed way apparently able to deliver any imaginable tune! (I wish we can witness such concert). The interior design with its lavishness exceeds expectations (anyhow running high given the exterior extravagance). Abundance of luxurious materials like oak and Italian walnut, Greek and Italian marble, bronze; architectural details - galleries, arches, Doric-style columns, vaulted ceilings; decorations and furnishing - crystal chandeliers, Luis XIV-style furniture and the list can only go on…. Noteworthy are Golden Salon with its design and decorations inspired by Versaille’s Hall of Mirrors, Eva Peron Salon (from where she ran her charity foundation), San Martin Room, Esteban Echevaria Library (occupying the first floor), Treasure Library (including many documents and books from the colonial times). In 1946 the building was declared a National Historic Monument. 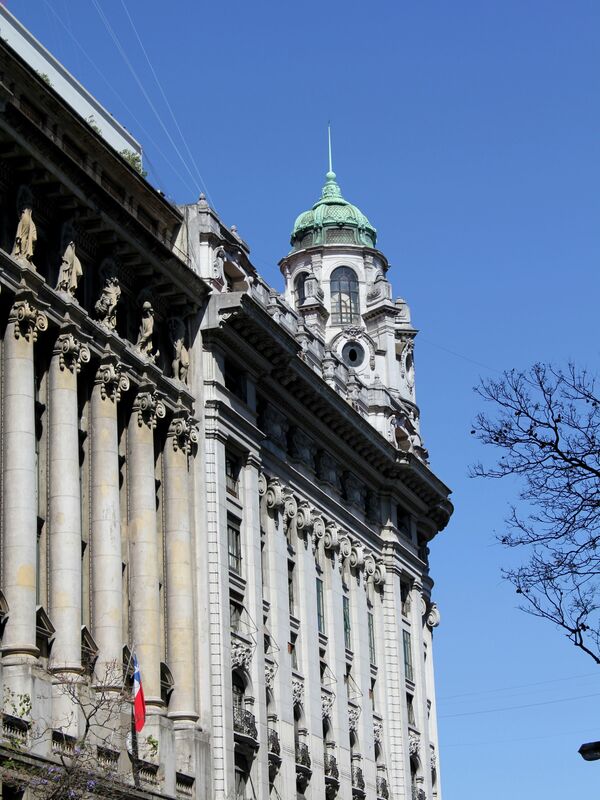 When visiting the Plaza de Mayo it is impossible to miss the Palacio Legislativo (City Legislature) thanks to its tower dominating the cityscape. From the late 18th century’s this block (next to City Hall - Cabildo and Municipal Cathedral) was occupied by the Police Department and the house of the black slave trader - Pedro Duval (ouch! - seems like connections, protection and blessings). Since the abolition of slavery in Argentina in early 1813, the “business” went down and government cleaned up the place by acquiring the house and giving it to the General San Martin. At the end of the same century the house (called Los Altos de Riglos) was owned by Don Miguel Riglos (at those times the name “Altos” was given to houses with two or more floors). Next to Cabildo - the Government Palace of Buenos Aires. In the center of the picture is the former Edificio Banco Argentino Uruguayo and on the right the Metropolitan Cathedral. In late 1880’s a major remodeling work of this part of Buenos was undertaken by municipality under the supervision of Juan Antonio Buschiazzo then the director of Public Works of the Municipality. 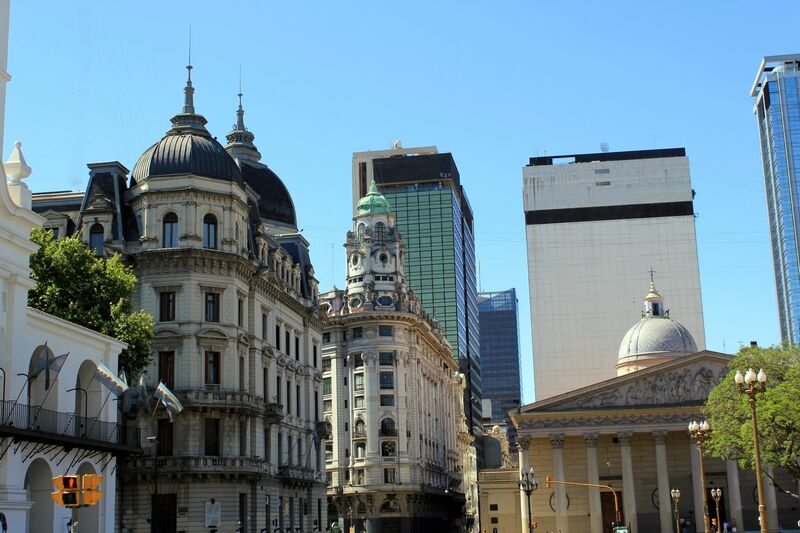 Indeed it was Buschiazzo (an Italian-born Argentinean architect who throughout the years of his tenure greatly contributed to the modernization and beautification of Buenos Aires) who designed the project of the Municipal Palace. The construction began in 1891 in times of austerity (what may explain its “architectural modesty”) and finished in 1893. During early 1910’s the new wing facing Rivadavia Street was added to the Municipal Palace. Benefiting from country’s economic prosperity, the new superbly chamfered section was topped with a tower crowned with dome. As we all well know, if something can go wrong, eventually it will. Following this rule, soon after structural problems forced constructor to replace the heavy tower and dome restoring by the same time the architectural symmetry of the Palacio Municipal. For all of us it is also a prove that not always what we initially think is bad later is ending badly! Our tour of the plaza wouldn’t be complete without mentioning Madres de la Plaza de Mayo. It all started here back in 1977 when the group of women dressed in black with white handkerchiefs led by Azucena Villaflor de Vicenti started their silent demonstrations. They demanded to know the fates of their loved ones kidnapped by the military regime. Soon, the Mothers of the Plaza de Mayo became the symbol of courage, leading every Thursday at 3:30 pm the silent but powerful fight for justice and human rights. Several of them (including Azucena) disappeared themselves as the military regime tried to eradicate the “Silent Protests”. Tragically “The Disappeared” never came back homes but the effort of Azucena’s movement brought worldwide attention and greatly helped to topple the military regime. After the consecutive collapses of the military regime and following rightist governments the Movement re-focused its efforts on reuniting children (kidnapped as new born babies by the officials of the military regime) with their biological families. Since then, more than hundred children (actually already young men and women) found their families. With time, mothers gradually became grandmothers and movement started to be called Abuelas de la Plaza de Mayo. In 2010, for their “tireless battle for human rights and peace by standing up to oppression, injustice and impunity” the Non Governmental Organization (NGO) of the Madres de la Plaza de Mayo was awarded with precious UNESCO Peace Price. After the return of democracy to the socio-political life in Argentina the Silent Protests on the Plaza de Mayo came to the end (at least for the original cause). But this apparent “peace” does not signalize that paradise is taking roots on Earth. To learn more about present actions and plans of Madres de la Plaza de Mayo, you can visit the Café Literario Osvaldo Bayer, just off the Plaza Congresso (far end of the Avenida de Mayo). This café shop is housed in the headquarters of the NGO “The Mothers of the Plaza de Mayo”. Sipping a coffee (In Buenos you cannot go far without that habit) you will find yourself immersed in a left-wing atmosphere with iconic photos of Che decorating walls, impressive library of Latino-American books, newspapers and magazines supporting human rights and friendly people covering the full spectrum of ages from young students to Abuelas…. And indeed, it is a lovely place not only for a cup of coffee, but also to engage in discussions, exchange opinions….